I do not accept any type of returns, all sales are final. As I do inspect, take pictures for every item prior shipping to avoid any type of returns. Please ask any question prior purchasing your items, I would be more than happy to answer any type of questions. All my items are AUTHENTIC, I do not carry fake or damage items. I buy all my items as. if they were for me. 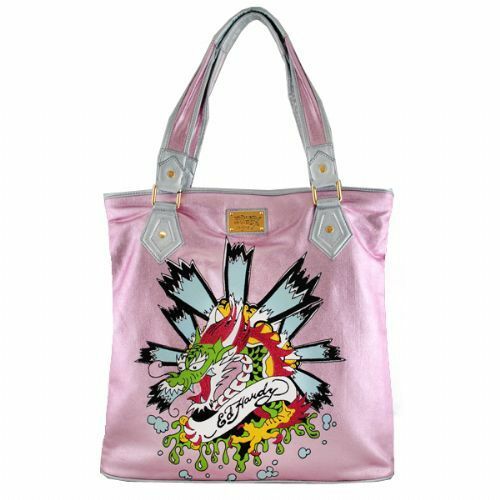 Ed Hardy Aitania Large Tote NWT EHCOAIT0071-PK Pink Limited Edition MSRP 174.00 Tax 100% Authentic The Ed Hardy Aitania Large Tote is one of most popular bags and is part of the Ed Hardy Handbag Collection. 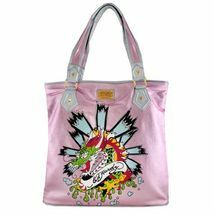 Designers: Don Ed Hardy Fabric: 60% Cotton: 40% PVC Color: Pink Measurements App: 18.5 x 17.5 x 3" (W x H x D), Handle Drop: 9.5" The Ed Hardy Aitania Large Tote is one of most popular bags and is part of the Ed Hardy Handbag Collection. The Metallic coated fabric tote with "Ed Hardy" artwork on front with rhinestone decal and printed text with the words "Peace for all Mankind" on the back. It features - Double shoulder straps and top zip closure. It also features interior zip pocket, open pocket and cell phone pocket. Carry all your essentials in style with this trendy and roomy women's tote bag. Aitania Tote. Mettalic fabric. Gold-toned Hardware. Rhinestone Detail. Double handles. Main pocket with zip closure. Internal zip pocket. Bag has 4 gold stud at the bottom for support. Open pocket and cellphone slot. Includes dustbag. "PLEASE NOTE I DO NOT SHIP OUT OF THE US" Please feel free to ask any questions PRIOR your purchase, I am not affiliated with Ed Hardy in any way. Item is "SMOKE AND PET FREE" **PLEASE NOTE **ALL SALES ARE FINAL** I DO NOT CANCEL ANY ORDERS OR ACCEPT ANY RETURNS ALL SALES ARE FINAL. PAYMENTS IS DUE WITHIN THE END OF YOUR PURCHASE THROUGH PAYPAL, I ONLY SHIP TO CONFIRM ADDRESS. A NON-PAID BUYER DISPUTE WILL BE FILED WITH BONANZA AND THE ITEM WILL BE RE- LISTED. Shipping: Item will ship within 3 business days of cleared payment and will be shipped by USPS. Once the item is ship, I am not responsible for any damage, loss, or postal delay!! Thanks You.